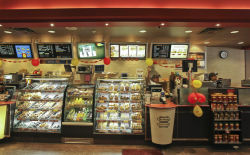 Well-established and profitable Tim Hortons network for sale. This is a RARE opportunity to purchase a profitable well established Tim Hortons franchise in the Midwest. Sales have consistently been growing and they are the market leader in their area. Tim Hortons is one of the World’s 100 most beloved brands with over 5,000 units in Canada and 900 in the United States. In addition to their brand strength depending on the buyer’s qualifications development growth opportunities are available. This is truly unique opportunity, for a well-known mature fast food franchise system to have so much available territory. Tim Hortons is the QSR leader in Canada, and is experiencing rapid growth in the US. Our brand is known for offering high-quality products, providing a great experience for our franchisees and for the impact we have in the community. Tim Hortons are the third largest coffee chain in the world further proving that the concept resonates globally. To find out more about this Tim Hortons Network please fill out the form below and submit.